America’s state legislatures are polarized–just like Congress–between liberals and conservatives, Democrats and Republicans. That polarization creates gridlock, when it’s difficult to get legislation passed and policy problems addressed. But just how polarized are they? We haven’t been able to tell in the past, because we haven’t been able to determine just how liberal or conservative state legislators are in all 50 states. One major reason why is that each state in its own way is rather unique. Massachusetts Republicans aren’t the same as Texas Republicans; the same is true for each state’s Democrats. Nor do they vote on the same things. These immutable differences mean that measuring ideology–and levels of polarization–in state legislatures is much more difficult than that for Congress. Nolan McCarty (Princeton University) and I wrote an academic paper in 2011 that explained our method for overcoming this problem. We have been working diligently since then to update our data, which we have released for free to the scholarly community and public here. With our aggregate data in hand (and updated from our original estimates), we can begin to make precise comparisons between the states and Congress on a number of dimensions, including polarization. The plot below summarizes our measures for legislative polarization, averaging across all the years of our data (approximately 1996-2008), and across both legislative chambers (except for Nebraska). The horizontal axis measures the amount of polarization, defined as the average ideological distance between the median of the Democratic and Republican parties in the state legislative chambers; larger numbers indicate more division. 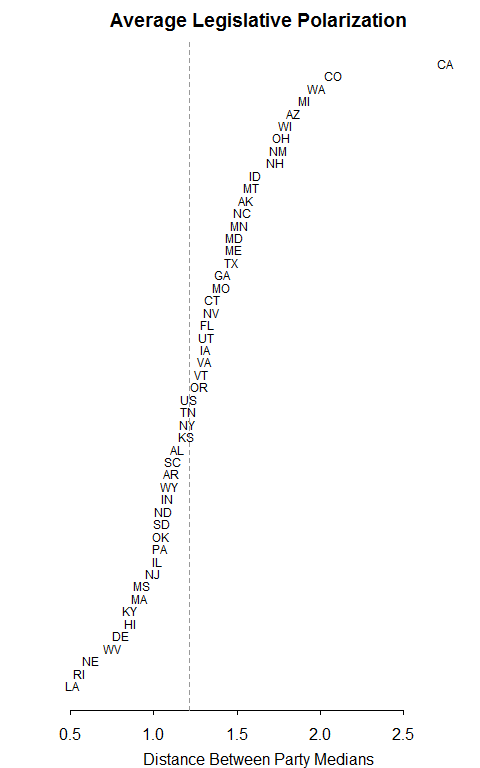 The dashed line is the level of Congressional polarization, included as a comparison (“US”). What becomes immediately obvious is how different the states are from each other–and Congress–in terms of polarization. Some states, like Louisiana and Rhode Island, have quite unpolarized state legislatures. In Louisiana, both parties are fairly conservative, and in Rhode Island, they are both fairly liberal. The state that sticks out like a sore thumb is my current home state, California. It is incredibly polarized; Democrats are extremely liberal, and Republicans are extremely conservative. In fact, California’s polarization is considerably larger than that in Congress (unlike Congress, however, Democrats dominate the state so thoroughly that this polarization is becoming increasingly toothless). This is also true for a number of other states. All in all, polarization varies fairly dramatically across states. The natural question is: why? Nolan McCarty and I–along with some coauthors–are engaged in a number of different research projects to try to answer that very question, as are a number of other scholars. NB: We can measure Nebraska’s distance between party medians because, despite the fact that the Unicameral is officially nonpartisan, party affiliations of legislators are unofficially well known. We used friend and coauthor Seth Masket’s excellent Nebraska party data for that purpose. This entry was posted in Polarization on May 21, 2013 by Boris Shor.